On the other hand, though, I remind myself that this China is the engine of the world’s emerging new economy. Since the responsibilities of my job now span the Asia-Pacific, China represents the single, most important market from a business standpoint. I flew to China, therefore, with two unique perspectives: the spiritual perspective, and the business perspective. I was a little scared from a spiritual standpoint. Is there a chance that I would be detained in China for bringing articles of our Faith - in particular, a large Crucifix, a Rosary, as well as several bottles of holy water? The plane ride to China was a comforting one. It is always re-assuring to travel with fellow Filipinos to a foreign land - thanks to PAL. To my left sat a very jovial, large Filipino who, to my delight, prayed the Rosary during the plane ride. At least I knew I wasn’t the only one visiting China who had a Rosary in his pocket. Upon my arrival in Beijing International Airport, I was greeted with an unsettling incident. I was walking towards the immigration counter when all of a sudden, the alarm system that supposedly measures body heat (and tracks down sick passengers) blared as I passed by. The system is meant to prevent entry to China of sick passengers - possibly leading to quarantine. Two female Chinese airport inspection personnel pulled me aside, and started talking to me in completely indiscernible Chinese. For a couple of minutes, we “spoke” to each other in hand gestures. Finally, an airport security official who knew limited English was called in, and asked me if I was sick, or if I had a recent operation. My answer was obviously no, but for some reason, the system tagged me as “sick”. They made me go through the detection system a second time, a third time, a fourth time...happily, the alarm did not sound again! After what seemed like ages, they finally let me go my way. Whew! My first impression of Beijing was that it was just like any other Asian city that I’ve visited. In reality, though, I never really got the chance to see any of the tourist sites. My time was spent in just three venues: the hotel, our office, and a Chinese restaurant downtown that served the best Peking Duck I’ve tasted. After two relatively uneventful days in Beijing, I went to the airport to take a short plane ride to Shanghai. For some strange reason, my most eventful experiences in China seemed to take place always in airports. An airport official approached me, and asked me to go with him to a separate room at the back of the check-in counter. I entered the room and saw a Chinese security official operating the “x-ray” equipment that is used to “see” what is inside passenger luggage. He gestured to my bag, and pointed to the screen to a “suspicious” metallic object that he found inside my luggage. There, in the screen, was the grainy, x-ray image of the Crucifix that was stored inside my luggage. He gestured to me to open my bag to show him the “object”. My heart beat a little faster. Was this the feared government persecution of Christians in China that I had often read and heard about? I opened my bag, pulled out the Crucifix and showed it to him. Upon seeing it, the Chinese security official smiled, his face flashed with recognition and a mildly apologetic look. Whew! For a while, I thought I would be handcuffed and thrown to a detention center for interrogation! Shanghai is an interesting combination of the old and the new China. While there are traces of the old and imperial China in the form of temples and traditional Chinese structures, it is largely a modern cosmopolitan city, with skyscrapers and towers rivaling those in New York. My stay in Shanghai was an experience in contrasts. In the evening, I went out of my hotel to look for a Chinese restaurant. On the way out, at least three people approached me, offering me, in their own words, “beautiful Shanghai women” as entertainment. The shocking thing was that it seemed to be such a normal activity to openly approach foreigners and offer them prostitutes. Despite repeatedly saying “no”, the “solicitors” were unbelievably persistent, following me and cajoling me for probably at least half a kilometer of walking. I was scared that I would be mugged right then and there in the dark streets of Shanghai for refusing them. I went back to my hotel and had dinner instead in a nearby Chinese restaurant. After dinner, I had the opportunity for the solitude I so craved for. In front of the hotel was a small garden, dotted with shades of trees and benches under the clear, Shanghai moonlight. After several days of hotel and airplane airconditioning, it was a most beautiful experience to simply smell the fresh air, walk, and pray the Rosary in silence under the moonlight. In the end, I realized that what truly soothes the soul, what truly gives deep, peaceful joy, is not the beautiful skyscrapers and manmade structures, not the glitter of stores lined with expensive clothes and shoes. Instead, what truly soothes the soul is the simple beauty of God’s creation - the quiet still of the night, the bright moonlight, the sound of birds chirping, the fresh breeze. I had a little taste of what it was like for Jesus to depart from the crowds and withdraw to the mountain in solitude. It was 10pm, and time to socialize with my Chinese colleagues. We went to a place that was a bustling array of bars and restaurants, filled with both foreigners and locals drinking the night away. Social manners, of course, meant that a non-alcoholic drinker like me had to drink a little alcohol - even if it meant a slight headache in the end. What was truly ironic is that here I was, in a place of worldly allurement that was called in Chinese “New Heaven, New Earth”. In various apparitions, prophetic messages, as well as the Bible, the phrase “new heaven, new earth” is associated with the beautiful, new paradise that Jesus promises to restore on earth during His Second Coming. Although I had very limited interactions with the Chinese people in my brief stay in China, I nonetheless realized an important truth that has changed my entire outlook towards China. The China that the press portrays - the big, new international superpower bully and the atheistic nation that threatens Christianity - is the China that the communist government projects. It’s the government - not the Chinese people - that sends its ships to Philippine shores and claims our islands as their own. It’s the government - not the Chinese people - that defies the Vatican and sets up its own version of the Catholic Church. It’s the government - not the Chinese people - that has suppressed the Christian Faith all these years. Just two weeks after my trip to mainland China, I had the opportunity to visit the “other China” - the former renegade province of China now known as Taiwan. My first Sunday Mass in Taiwan was a most memorable one. The Catholic Church nearest to my hotel was a mere 15 minutes away. Its name was most meaningful to me: Holy Family Cathedral. Beside the church was a massive pillar of stone: on top of the pillar was a cross, while beneath the pillar was a grotto of the Blessed Mother. 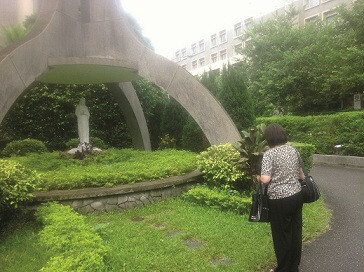 I saw several Taiwanese women praying in front of the Blessed Mother’s statue. Outside the church, I saw people of various nationalities mingling and waiting for the English Mass to start: blacks, whites, Chinese, Filipinos. I went to the small bookstore located at the entrance of the church and left a few hundred copies of Rosary prayer guides that our family foundation distributes. Lo and behold, I saw a small stampita of Lorenzo Ruiz in the small table where I placed the various prayer cards. I was far from home, and yet I felt perfectly at home. I entered the church and saw that the Taiwanese Mass that preceded the English mass was not yet over. A sizeable Taiwanese crowd was in attendance: 281 in total, based on an electronic counter. The sound of Latin music filled the entire cathedral. After the Taiwanese Mass, many Taiwanese flocked to a statue of the Blessed Mother to light candles and pray. A young child of probably 4-5 years knelt in front of the Blessed Mother’s statue: hands clasped together, while her mother kneeling beside him was whispering in his ears, most likely teaching him to pray. The English Mass I attended in the cathedral was a most touching one. A mostly-Filipino choir led the community in singing songs sung back home. As a church musician back home, it was a truly uplifting experience to sing familiar songs in a foreign land - songs most likely “exported” from the Philippines. Ah, indeed, it is truly music that connects with the soul in the liturgy and uplifts us during Holy Mass. In the pew to my right, I couldn’t help but notice a black man with his little boy. This man sang each and every song in the Mass with so much passion, so much emotion: hands raised, eyes closed, lips smiling in complete bliss. What a truly beautiful sight to see a grown man with his little boy so engaged and so passionate in his participation in the Mass. At the end of the Mass, before the final blessing, the priest asked the entire congregation to sit down for a “tradition” that they observed in the cathedral. He asked all first-time Mass goers in the cathedral to stand up and be recognized. An usher went around, gave a wireless microphone to each of us first-time Mass goers in the parish, and asked us to tell everyone our country of origin - after which the entire congregation applauded to acknowledge us. The first-timers consisted of people from nations all over the world: Brazil, Guatamela, United States, Philippines. The “winning” nationality with the most first-timers? The Philippines! What a truly wonderful feeling it was to witness the universality of the Catholic Church. The feeling I had was almost no different from that of attending World Youth Day: there is simply something truly inspiring seeing people from many corners of the world practicing the Catholic Faith with so much fervor. In my trip to China and the “other China” (Taiwan), there were really no awe-inspiring moments similar to those I have experienced in Guadalupe and Lourdes. And yet, this was a beautiful spiritual experience in its own right. I enjoyed very much the blissful moments of solitude amid the bustle of Taiwan, Beijing and Shanghai. I enjoyed the experience of attending Holy Mass in a beautiful, multi-cultural setting in Taiwan. And finally, I realized the importance of praying for China and its truly unfortunate people: a nation of a billion people who have become atheist because of a few powerful communist leaders, past and present. This China, after all, is the huge, “red dragon” that will dominate the world in the near future. A China that is led by a communist regime determined to continue suppressing the Catholic Faith. What will the world be like if the “red dragon” growls and imposes its will on weaker nations like ours? 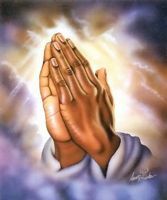 Truly, we must pray for the conversion of China’s leaders like never before. Click here to return from My China Experience to Inspirational Stories.